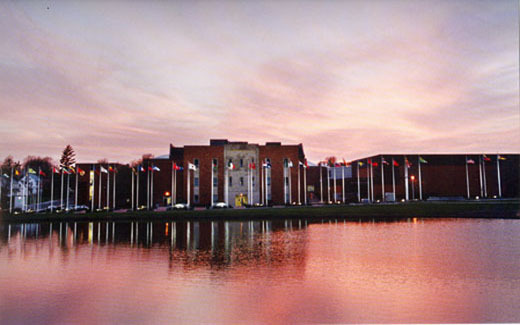 The Joyce and Harvey White International Plaza was constructed in 1998 as a memorial to Northwest's global enrollment. The Plaza, which is a symbol of good will and peace, recognizes the various countries of currently enrolled students. 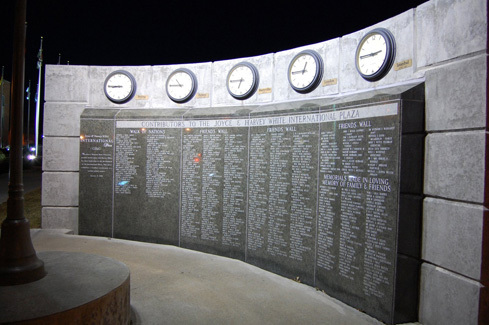 The International Plaza boasts the flags of 54 nations, and also displays 5 clocks showing the time from Maryville to Istanbul. Joyce White (formerly Smith) was born in Maryville and attended kindergarten at Northwest in the southwest 1st floor of the Administration Building. A graduate of Maryville High School, Joyce attended Northwest Missouri State University, completing a B.S. in Business Education and Spanish. At Northwest Joyce made many friends that would last a lifetime, including her best friend, international student Mary "Maria" de Ardeles Stein of Argentina. Through her friendship with Maria and the support of the Rotary International chapter in Maria's hometown of Tucuman, located in the foothills of the Andes Mountains, Joyce studied Spanish for a year in Argentina. Joyce's passion for promoting diversity and helping international students acclimate to life in the United States was the impetus for her establishing an organization in the 1960s called the "Wives of the World." As she explains, in those days most foreign students at institutions across America were men, and their wives often found isolated in campus housing, sometimes with small children and with little or no knowledge of the English language. Wives of the World worked to ensure these women were supported and able to interact successfully in their new community by providing free English language instruction and other services. Joyce was a teacher both at Maryville High School and at Northwest. During her years at Northwest, she taught literature under the chairmanship of Dr. Joseph Dreps. 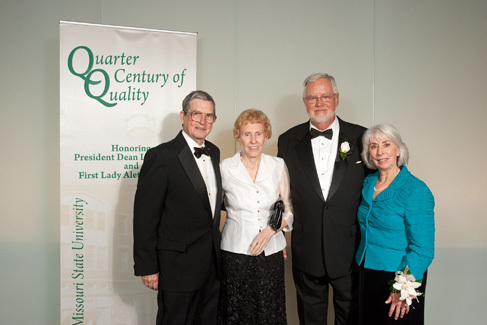 Joyce would later tell Northwest President Dr. Robert Foster that these were the happiest years of her life! Although the Whites life experiences have lead them far away from Missouri, Northwest nevertheless remains dear to both their hearts. To quote former Bearcat Coach Ryland Milner, "Once a Bearcat, Always a Bearcat," and the Whites have found this to be true, actively supporting Northwest students through scholarship opportunities. 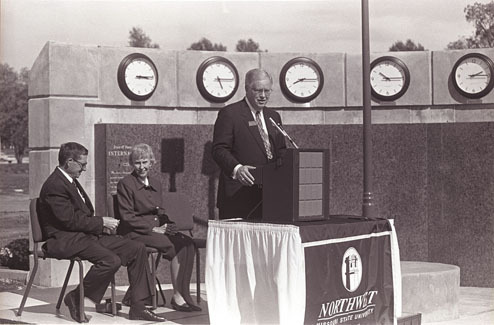 Joyce also served two terms on the Northwest Foundation Board during some of the more formative years leading to the Campaign for Northwest that raised more than 40 million dollars for the institution.